Helping the humans make the bed, Allie? 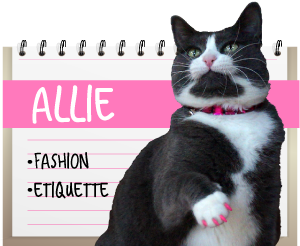 you are doing a great job too Allie. Mom could never do it without you. "I TOLD you I wanted French tips!" "I think I've chipped a nail"
Allie: Oh Caro, you are SO right! I *hate* it when I chip a nail! That's why I let Mother do all the work and I supervise. Sparkle, oooooh French Tips! MOMMMMM! I need a new mani/pedi! !